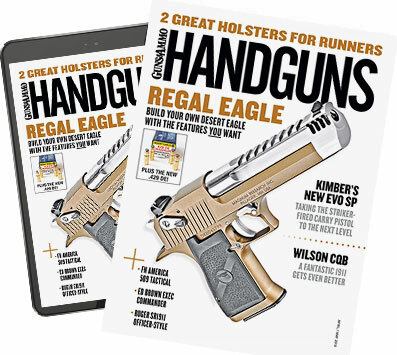 Brian Enos, along with his good friend Rob Leatham, developed the straight-thumbs method of gripping a handgun that is the standard among serious shooters today. Photo by Nidaa A. Two grandmaster shooters discuss secrets of gripping the combat auto pistol. Thumb-over-thumb will reliably disengage the grip safety of a 1911 every time. 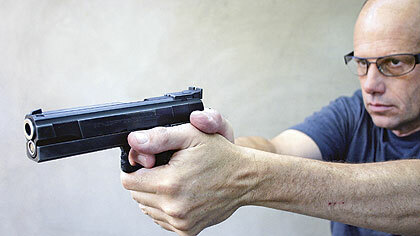 Straight-thumbs, depending on the size and shape of the shooter's hands, can pull the web of the master hand far enough away from the back of the piece that the grip safety won't be fully depressed, resulting in failures of the gun to fire. "After that I started analyzing why this grip was working so well, and I realized it was because with that amount of even pressure on the gun, and the thumbs not pressing into the side of the gun with lateral pressure, your grip became almost like this mechanical device, a machine rest, that didn't allow the gun to swivel left or right, just up and down. I got away from the idea of trying to use my grip to control recoil. I realized the amount of muzzle flip isn't that important. What's important is the consistency of how the gun moves, not how much it moves." "Let me make this clear: Within reason it doesn't matter how high the front of the gun flips. What's really important is the neutrality of the grip, that you don't interfere with the gun's inherent ability to return to the exact same spot every time. The gun will do that on its own if you just let it. Getting your hands high up on the gun is to get more leverage to control muzzle flip; the neutral grip is another thing. The higher up you get on the gun, the less the muzzle will flip, and that's a good thing, but it doesn't affect the neutrality of the grip. I think it's important not to mix those two concepts. You can have great sight tracking no matter how much the muzzle flips. With practice, your body learns to naturally return the gun to the same spot no matter how much it moves in between."